The 30th of March, Land Day, was first inscribed in Palestinian history in 1976, when a mass, popular uprising in occupied Palestine ’48 confronted land confiscation and expropriation at the hands of the settler-colonial Zionist state. On that day in 1976, six Palestinians were killed as they protested in a general strike against the ongoing Nakba, after thirty years of repression and dispossession. Their names have become indelibly inked in Palestinian history and the history of those who struggle around the world – Kheir Mohammad Salim Yasin, Khadija Qasem Shawahneh, Raja Hussein Abu Rayya, Khader Eid Mahmoud Khalayleh, Muhsin Hasan Said Taha and Raafat Ali Al-Zheiri – shot down as they marched to defend their land. Today, in besieged Gaza, occupied Palestine, tens of thousands of marchers rose up once again in a mass, popular march commemorating that day 42 years ago with today’s demand to liberate the land, centering the right to return of Palestinian refugees – the Great March of Return. Over 70 percent of the Palestinian population in Gaza are refugees denied their right to return to their homes, lands and villages for 70 years. And once again, the Israeli state revealed its nature, shooting down 16 martyrs of the land and return in another Land Day massacre, 42 years after the first. The day began with the killing of Palestinian farmer Omar Samour by an Israeli tank shell. This latest murder of a Palestinian farmer further illustrates the unending drive to seize Palestinian land and attack Palestinian productive capacity and self-sufficiently, farmers in Gaza have been under severe attack. The so-called “buffer zone” imposed on farmers in Gaza has seized 30 percent of the land, including the most fertile. Indeed, Palestinian fishers and Palestinian farmers have particularly borne the brunt of repeated Israeli fire, attacks and murders, aimed at eliminating Palestinian self-sufficiency even in the narrow Gaza Strip, hemmed in by sky, land and sea by deadly occupation forces. And as thousands of Palestinian refugees in Gaza massed in a popular march near the illegitimate colonial barrier and so-called “borders” imposed by the occupation state, occupation forces and sharpshooters opened fire directly on popular demonstrators calling for their rights – for return, liberation, an end to the siege. Their names are now also immortal in Palestinian history and the history of those who struggle – Naji Abu Hajir, Mohammed Kamal Al-Najjar, Wahid Nasrallah Abu Samour, Amin Mansour Abu Muammar, Mohammed Naeem Abu Amr, Ahmed Ibrahim Ashour Odeh, Jihad Ahmed Fraina, Mahmoud Saadi Rahmi, Abdel Fattah Abdel Nabi, Ibrahim Salah Abu Shaar, Abd al-Qader Marhi al-Hawajri, Sari Walid Abu Odeh, Hamdan Isma’il Abu Amsha, Jihad Zuhair Abu Jamous, and Bader al-Sabbagh. They were farmers, students, talented artists, fathers, sons and loved ones, who loved their people, their land, and their vision of freedom, and their loss is painful and immense. It must also be an urgent call to action to honor the sacrifices of the martyrs of the land and return, to demand the freedom of the prisoners and the freedom of all of Palestine – the implementation of Palestinian refugees’ right to return, at the heart of the Palestinian cause. Of course, this is far from the first such massacre. It comes in a long line of massacres and attacks targeting Palestinian popular resistance, especially that of Palestinian refugees demanding their right to return. We remember the murders of Palestinian refugees from Lebanon and Syria who marched to the borders and braved the crossing to their long-denied homeland in May and June 2011. We also recall the decades of killings of Palestinians labeled “infiltrators” for seeking to return to their own stolen land from exile. These deaths must not be allowed to pass unnoticed and unremarked, and the movement for which their lives were taken must be supported with the widest popular mobilization. Let us take to the streets in every city in response to this massacre. Land Day has lived on to become an eternal anniversary because, everywhere, Palestinians, Arabs and supporters of the Palestinian cause responded to the land confiscation and the massacres with intensified struggle and resistance. Today’s sacrifices demand the same response. Infamous IDF general and war criminal Gabi Eizenkot, the promoter of the “Dahiyeh Doctrine” for its murderous assault on the people of the southern suburbs of Beirut in a (failed) attempt to smash the resistance, personally commanded the attacks on Palestinian marchers in Gaza. Of course, Eizenkot and his gunmen did not act alone – they are the vicious arm of an entire state project attacking the Palestinian people’s very existence. And their weaponry is backed up by the United States, Canada European states and other imperialist and colonialist powers, with the complicity of Arab reactionary regimes. These 16 precious lives deserve all of our mourning, but more urgently, all of our action. Demonstrations, mobilizations, artistic, cultural and legal actions to hold war criminals accountable and to end international imperialist backing for the ongoing war crimes in Gaza and against the entire Palestinian people are all urgently needed – today, tomorrow, in the coming week. April 17 is Palestinian Prisoners’ Day, a national and international day of action for the freedom of all Palestinian political prisoners, the prisoners of freedom, the prisoners of return and liberation, behind Zionist bars because of their commitment to the freedom of their people and their land. This year, April 17 can and must be a day of mobilization to liberate Palestinian prisoners, free the land and people of Palestine, break the siege on Gaza and confront all imperialist and Zionist attacks. Samidoun Palestinian Prisoner Solidarity Network urges supporters of Palestine around the world to mobilize in immediate and ongoing response to the Land Day massacre in solidarity with Palestinians in Gaza and the entire Palestinian people – including all of the millions of Palestinian refugees in exile and diaspora who struggle for their right to return home, the key to Palestinian liberation. Send your events and actions to us at samidoun@samidoun.net, on Facebook, or use the form to tell us about your actions in response to the Land Day Massacre and for Palestinian Prisoners’ Day. We will be publishing an international list of events and actions that will be regularly updated. 31 March, London: Land Day: Protest British imperialist support for Israel! 2 April, Copenhagen: Protest for a Free Palestine! 2 April, Lyon: Stop Israeli Crimes, Sanctions on Israel Now! 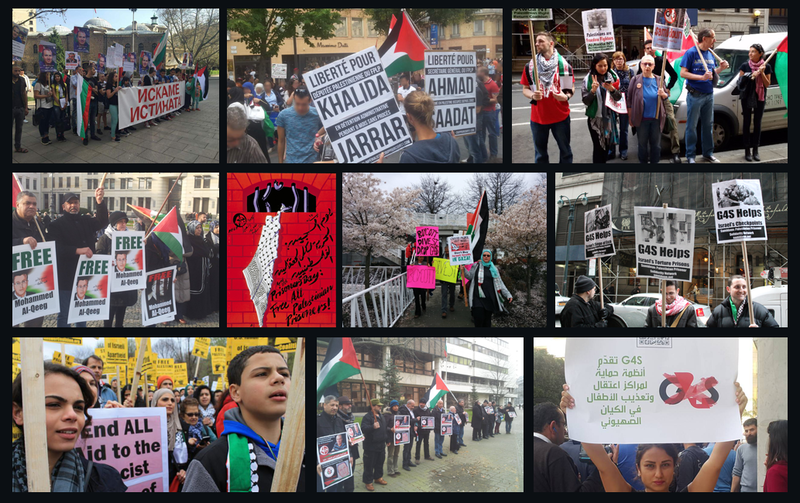 5 April, Boston: Put Israel on Trial, Not Ahed & Palestine! 5 April, Brussels: Rally: This one is for Gaza! 6 April, Toulouse: Rally for Gaza – End the siege! Stop the Israeli massacres! 6 April, Paris: GAZA – Stop the massacres! 7 April, Bonn: Rally against the Israeli massacre in Gaza! 7 April, Manchester: Emergency Protest – Stop the Massacres! Stop Arming Israel! 7 April, Bordeaux: Rally to Support Gaza! 7 April, Paris: Right to Movement for All! 7 April, Auxerre: Rally – Palestine Solidarity – Stop Israeli Crimes! 7 April, Montpellier: Rally for Gaza in resistance! 8 April, Gothenburg: Stop Israel’s attacks on Gaza! 11 April, Toulouse: Freedom for all Palestinian Prisoners! 12 April, London: As Gaza rebels, how can Palestine be free? 14 April, London: Protest outside Israeli Embassy – Free all Palestinian Prisoners! 14 April, Manchester: Solidarity with Palestine! Picket Israel’s British sponsors! 14 April, Nimes: Rally in solidarity with Gaza! 14 April, Montpellier: Stop the massacres of Palestinian civilians in Gaza! 14 April, Washington DC: March on the White House: Stop the Wars! Minneapolis: Stop Endless U.S. Wars! New York City: End US Wars at Home and Abroad! Paris: Freedom March on Palestinian Prisoners’ Day! Lille: Solidarity with Palestinian prisoners! Solidarity with Georges Abdallah! Chicago: Stop the Wars! March and Rally! Copenhagen: Solidarity demonstration with Gaza! Philadelphia: We will not be silent! Philly Don’t Orchestrate Apartheid!